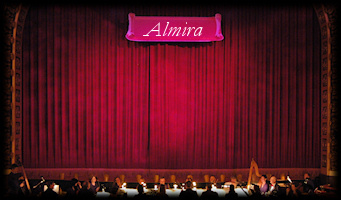 Boston Early Music Festival presents for its 2013 edition a new production of Almira by Friedrich Christian Feustking and Georg Friedrich Handel. Gilbert Blin, since 2008 Stage Director in Residence at the Boston Early Music Festival, directs this new production and also designs the sets. Three other members of Groupe de Recherche collaborate to the project: Rémy-Michel Trotier as artistic assistant to the Set Designer, Meriem Bahri as assistant to the Costume Designer, and Mickaël Bouffard as dancer.